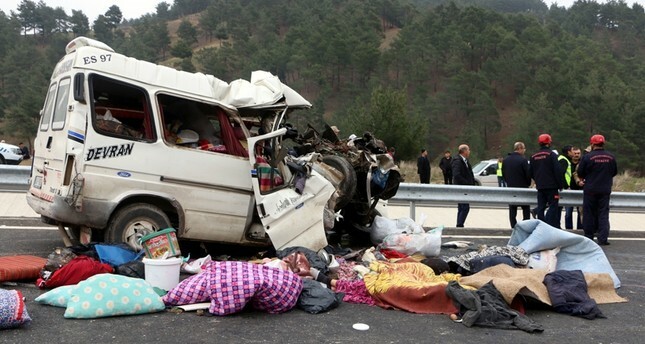 At least nine people, including four children, were killed, and another four were injured after a minibus crashed into a truck in Turkey's Kahramanmaraş, a city in the Mediterranean Region, Turkish media reported Saturday. According to reports, the vehicles involved in the crash, which took place early Saturday on the Kahramanmaraş-Kayseri highway, were traveling in the same direction. Emergency personnel including firefighters, medical teams and police arrived at the scene of the accident and took necessary measures. The injured were immediately transferred to nearby hospitals to receive medical treatment, reports added. Last month, eight people were killed and at least two others were injured after a bus collided with a truck in Turkey's eastern Van province.